The Mermaid's Tale: Will eggs kill you? The truest answer is "It depends"
yup, gonna go fry up my homeraised, pastured bacon, throw in a couple free range eggs from my yard and toast a slice of homemade whole grain bread with local flour to go with it. Yum.... Proper breakfast! 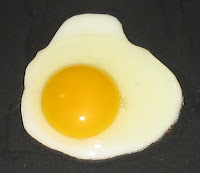 I believe that if you have gallbladder problems, eggs should be avoided.